Autumn in the Lake District is also a perfect time for photography, with a beautiful combination of woodland, lakes and mountains, and a palette of reds, browns, yellows and green, the range of colours on offer are fantastic. Tree lined paths scattered with fallen leaves offer ‘leading lines’ and interesting lighting potential. If you get there when the mist is around you could get shots oozing with atmosphere. Experiment with your positioning – you can get some great shots with leaves backlit (the sun on the other side of the leaves to you). If you’re lucky, rays of light coming through the trees make epic photography material. 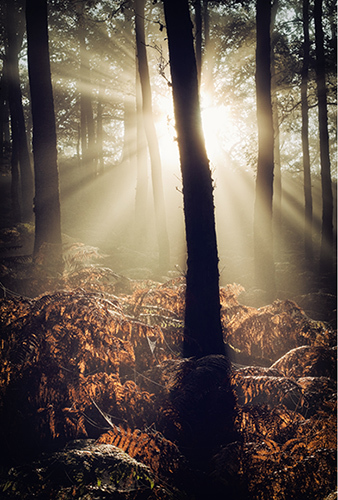 Try positioning yourself so that sun is obscured by a tree trunk to make the most of this effect. What time of day should you get out? The sun’s track through the sky is lower in autumn than summer. This means ‘good light’ is available for longer periods throughout the day. That said, an early start or a later finish will offer the best conditions, particularly the morning when cold air sits in low lying areas bringing mist/fog. What kit should you take? Take out what you normally use and are comfortable with. It’s more important to use your imagination at this time of year than spend time rifling through a bag full of kit you haven’t used before. If you have a DSLR try using a large aperture on your lens – the shallow depth of field it offers is great for close ups of leaves, mushrooms etc. At the same time, with the aperture stopped down, you can get a nice starburst effect from points of light such as the sun peeping between trees. If you have a polarising filter it will increase the saturation of colours and improve contrast. 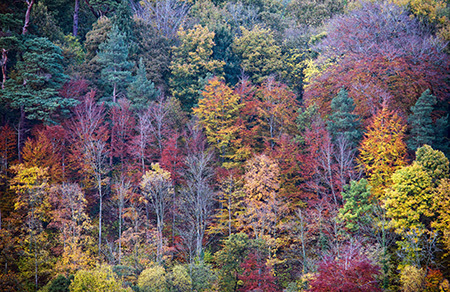 Those colours (which are often ‘the’ subject during autumn) will really pop and add emphasis to the image. Well, it depends on what you like to photograph but colours and light are the key things at this time of year. 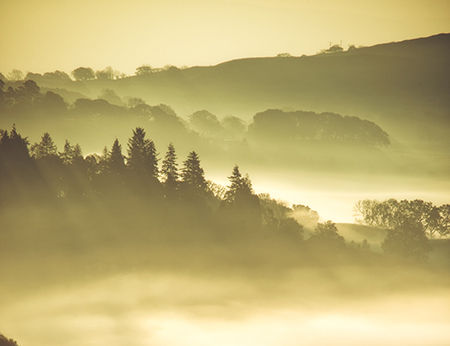 If conditions are right, go for the classic wide angle misty landscape. That said, don’t neglect the smaller things. Work your location to ensure you’ve made the most of what’s on offer to you. That can mean isolating parts of a scene with a longer focal length or physically getting closer in and looking for subjects that are about details and textures. What if the weather doesn’t look promising? Autumn days can often be sunshine and showers – these conditions can be great for photography with dramatic lighting between downpours. If you’re lucky, you might get a rainbow! If it’s windy, get your camera set up on a steady tripod and hone in on the movement of a trees branches and leaves. These can make for some really interesting shots. Whatever you do, make sure you’re ready to make the most of any favourable conditions because before you know it the leaves are gone and we’re heading into winter!